The seeds of the group were planted when one attraction he was working at was in need of a short original composition. After seeing the high cost estimates from the musicians, Mr. James told the haunt owners he could do it for nothing. With the help of a friend, they created what could be considered PWP’s first song. He still felt the need to create dark music even after October ended and soon called up some other musically inclined friends. They decided to just have fun with it and not to have any set goals other than keeping the tracks around 5 minutes and making sure they were doing something different. The end result was the band’s 2012 self-titled debut album. Despite the obvious Halloween connection, Psych Ward Psymphony starts off with a pair of creepified Christmas carols! “Jingle Bells PWP” has dark, foreboding jingling bells lead into a very dark piano rendition of this Christmas classic…then the guitars kick in to rock your face off! The scary, growling vocals are a great touch! “Holly & the Ivy” starts with a mix of jingling and tolling bells. But soon an eerie little girl sings “la la la” and blasting guitars usher in an adult woman (Jacquie Shifflette Darbro) singing the lyrics of this lesser-known Christmas song. The creative use of feedback and haunting organ work keep this from simply being a standard cover song. There’s even some season’s beatings thrown in for good measure! Those without any winter plans for their haunt should skip right to “Turn Back.” A scary organ and traditional Halloween sound effects like a wolf howling and wailing wind join a voice whispering for the listener to turn back while it’s still not too late. But when you hear a vampire welcoming you in with dark piano accompaniment, you know it’s far too late to escape. Just like the poor sap you hear trying to laugh it off as ghostly wails are heard. Having a sepulchral voice mocking him during the guitar segment is an excellent touch, as is the evil laughter which takes us out. The sound of a crackling record brings us into “Death Waltz.” But the static and feedback soon turn into headbanging rock greatness and chilling sound effects. This contrasts nicely with the light (but intense) piano and percussion. In addition to the end portion being reminiscent of a certain John Carpenter horror favorite, this could also be used in the ballroom of a “Haunted House of Rock.” Another song with potential use inside of a haunt is “The Morrigan.” Named for a type of spirit, it appropriately features Jacquie Shifflette Darbro providing beautiful, but unnerving vocals. She’s presumably the one doing the crying later in the track. There are plenty of interesting touches in this, such as the sound effects, dreamy harps and how parts of the track sound like a radio tuning into two stations at once. There’s also some amazing stereo channel effects which make it seem like the audio is traveling across channels. Since there’s an evil voice which pops in from time to time to explain what the subject of this track is, why not use it for a display in your haunt’s spooky museum? The Morrigan can either be represented by a flying crank ghost or a puppet operated by a performer to trick patrons into thinking they’re watching an animated prop. Their reactions when the “prop” lunges at them are always worth it! The sounds of birds and someone walking outdoors take us into “Corpses,” where Robbie Rothzchild provides the sinister vocals about watching people die from disease. The spooky piano work, percussion, guitars and (of course) feedback provide the perfect backing. “Bad Place” is my favorite track of the album and has already gotten played several times over the course of the year. What starts off as a moody outdoor soundscape leads to a rockin’ musical conversation between a little kid and their grandfather about an old house. The child’s humorous commentary throughout the track was an excellent touch. I had to get up to answer my front door when I first listened to this track and noticed how the further away I got, the creepier it sounded. I could barely make out the music and sound effects, but the lyrics became nearly impossible to understand and sometimes sounded like screeching. So if you really want to freak people out, play this at a low volume as they wander through a dark maze or hallway. Cymbals are added to the rock mix in “Mama Told Me Not to Come,” along with a distorted recording of a man moaning. His moaning soon becomes rambling about his mother and people meeting gruesome fates in a house. The zapping sound effects are just one of the many effective touches, which also include the doctor’s notes at the end. This album revels in static and feedback, but “Hell’s Hell” stands out with its creative mixing. There’s plenty of slow, moody rock with some soft organ work and evil laughter thrown in for good measure. “The Death Lord” opens with a wide selection of disturbing sounds and horror movie stingers. It’s mostly wailing guitars, screaming and drilling after that, but the titular character does provide some commentary from time to time. Syncing this with an animatronic display of a torturer and some victims would be incredible. A motor starts up the carousel music in “12 Clowns,” which is soon followed by a man singing about 12 silly clowns. What a shame he gets choked to death before he can finish! His killer takes over the hosting duties and dumps us into a world of unnerving music (both of the rock and circus varieties), crying, laughter and other sound effects. You might want to use a motion detector to have this start playing as soon as people enter your haunted circus room. Things come to a close with “The Survivors?” Sirens blare and the wind howls as a whispering voice telling us to follow her. Such whispers occur many times under the moody guitar work and organ work. There are so many other creative audio effects to enjoy as well! 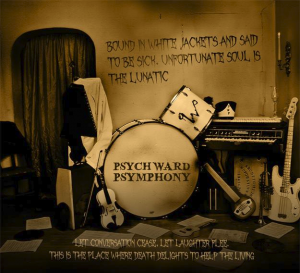 Screams, slamming doors, footsteps and soft spooky music give us a proper “Welcome” in the opening track of Psych Ward Psymphony 2013. A distorted voice talks to patients as he introduces the band and discusses their style. This is obviously not one of the tracks intended for use inside a haunted attraction, but could work outdoors if the album played on loop for guests. That way they can get a better idea of the style of music they’ll be listening to during their wait in line. “Taring Hem” starts off with the sound of a man violently enduring electroshock therapy. Other unhappy inhabitants are heard as Dan Gilman sings about the asylum and the horrors inflicted on its inhabitants. Yes, this is the same Dan Gilman from the band Tomorrow Will Fall and his band mates Nik Smith and Ron Giantonio also participated in this album. “Release From Pain” is an ambient track with a heavy rock feel weaving in and out of it. It’s mostly eerie piano work and synth touches coupled with percussion and snippets of guitar work. Since there are some screams heard at times, I think this has potential for use in a torture chamber scene. “Skeleton Key” is a ghastly little number where Nik Smith portrays a man who sings of killing his lover. In fact, we can hear her crying and begging for help among the water and night sounds. Playing this on a low volume makes it even creepier. Nick Haggard and the Co-Morbidities bring us “Bella Morte,” which kind of reminds me of something from Metalocalypse (which I mean as a compliment). Maybe it’s because of the repeated chanting of “awaken.” But the backwards masking, organ work and old school horror touches will keep anyone from mistaking it for a track from the show. “Dead Music” is moody and soft with the occasional sound effect tossed in for good measure. There are standards like breathing and the wind, but there are also wonderfully oddball ones like the woman whispering backwards. This practically begs to be used in a dark maze or garage haunt. Guitars bring us in to the catchy rock instrumental that is “When Evil Calls” while “Haunted” opts for a moody listening experience using slow, deliberate piano work and soft guitars. There’s a mild sense of tension and unease, and some sneaking notes too. It’s perfect for just about any haunt scene. “Ghost Banter” is an interesting case as it’s actually Dan Gilman’s song “Despair” mixed with recordings from a ghost hunt! The guitar work and wordless vocals are sure to give you the shivers even without the samples. Although I personally suggest playing it for people in line, it could work in a ghost scene. Especially if it’s set up so it looks like something happened to the ghost hunters and their abandoned equipment appears to be playing the recording. “Into The House” consists of creepy piano work coupled with snippets of wordless vocals and heavy synth tones. The synth work soon takes over, but the piano is always present. “Self Portrait” uses soft tones and dark touches of chimes with only the occasional use of guitars. There’s also some moments which remind me of something breathing. Use this when a room’s scares aren’t too “in your face,” like a hall of paintings with moving eyes. “Annabelle” is inspired by the same events the horror movie of the same name is based on. I love the drumming and narration about the possessed doll. The samples of the frightened child can and will cause goosebumps. Let’s return to the haunted museum concept I discussed earlier. You could have an exhibit about Annabelle using an old Raggedy Ann doll. Yes, the type of doll was changed for the movie. You can let the display placard and song build the tension to the point where the doll only moving slightly will terrify people. Unlike having the doll leap out at people, this hides the mechanism used to move it and makes people nervous about whether or not the doll will do anything else. “Haunt” kicks things off with ghostly tones and snippets of piano work. Whispers and various loud noises soon follow, along with synth tones. Soft electrical zapping leads to guitars and screams in “Betrayal,” whose beat reminds me of something you might hear in an old computer game. There’s also a cool musical rewind effect at one point. You could play this in a mad scientist’s lab, alien room or shock treatment room. If you choose the last option, you could pass off screams in this as the ghosts of past patients. The incredibly atmospheric “Self Portrait 7” makes heavy use of soft guitars, heavy tones and static which sounds similar to a swarm of flies. “Crippled By The Sorrow” combines the ramblings of a madman with rock music. If you are using an asylum theme and have a room people can only pass by, then do I have a suggestion for you! Set up a false door with a window in it so curious people can look inside. Position a restrained dummy to look like it’s crouching in said room, dim the lights and play this track. Make sure its face is obscured in some fashion. A Hannibal Lecter restraint mask, a face covered by long hair or having the head tilted downward all work. When people look in to try to figure out if it’s really a person or not, a hidden assistant in the room can pop up behind the glass. The incredibly catchy guitars and drums of “All Plea’s” are aided by screaming and vocals from an inmate at Taring Hem. After his confession of killing people, we hear someone say his pleas of clemency were denied. That’s when the heartbeat, explosions and sounds of things breaking make their presence known. You could pair this with electric chair prop, especially if an animatronic figure inside the chair starts thrashing around once the sound effects kick in. “Bonum Nocte” is the final track of the album. It’s also the shortest track since it only clocks in at a minute in length. Some sound effects lead to a voice telling us how our musical therapy is complete and we’re being admitted to the asylum. Not a bad way to close out your “Haunted House of Rock” if you’re using an asylum theme. 2013 proved to be an interesting year for the band, as the album grew quite popular among online radio stations and podcasts. They created music which appeared in YouTube videos promoting Halloween and horror-related products and services and even wrote what would have been the theme song for the fourth season of Making Monsters had the show not been canceled. Although their work ultimately made appearances on other cable shows, setbacks like this took the wind out of their sails. Which is a shame, since the music of Psych Ward Psymphony proves they have what it takes to both rock you and frighten you. Most of the tracks on both albums are suitable for individual looping and you can easily loop one or both albums on Halloween (except for the Christmas stuff, that is). I don’t know about you, but I think their rock influence makes it easier to play their work while you hand out candy without the content of the tracks matching up with your decorations. As they were initially released in limited runs of CDs, the albums are long out of print. 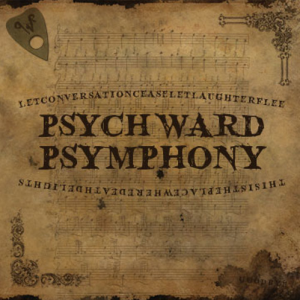 Thankfully Psych Ward Psymphony and Psych Ward Psymphony 2013 are available for free download on SoundCloud! The SoundCloud editions also include detailed notes about who wrote, produced and performed in each track. Music from both albums can be used royalty free in your haunted attraction as long as you put up a sign giving the band proper credit. The band may be on break right now, but Mr. James has hinted at the possibility of releasing more albums at some point in the future. The presence of several exclusive tracks on their ReverbNation page implies the best is yet to come. Special thanks to Psych Ward Psymphony for use of the images! Awesome write-up! I really appreciate everything you said! Dan Gilman PWP and Tomorrow Will Fall!